Other products available in the Sugar Blossom bath collection are the daintily packaged Love Me Tender Bath & Body Oil and Happily Ever After Bubble Bath. You deserve them! To enter and win a bottle of Champagne Wishes Mineral Bath Salts from the Sugar Blossom bath collection, please visit Bella il Fiore and comment on this post with your favorite finds. The hello again roller ball eye shadow looks cool! Such frilly little prissy thing; I love! An why yes, I am a subscriber! I like the Shimmer Powder Puff and the Sugar Kisses lip scrub. Both are pretty and girly and are products that are unique. I like the Whiped Body Creme in honeysuckle and Grapefruit. The Bonne Nuit boudoir set is marvelous; I love rhumba pants! I also would like to try the bath and body oil in honeysuckle grapefruit! I love the roller ball eye shadow (neat idea!) and the shimmer powder puff (CUTE!!!!). I'm an e-mail subscriber too! oh i love the bottles. my favorite so far is the bellas brush set. I like their pink and black nighty! Bath time, what a luxury. Mom of three, work full-time, plus have health issues. Anything bath related is awesome. I liked the lip tints as lipstick or gloss NEVER stays on and I don't have time to recolor every 5 minutes. I like the wrapped body creme. I would love to try the whiped body creme. I really like the whipped body creme. Thanks for the giveaway! I like the Mini Kiss Me Now Lip Gloss! I would love to try the whipped body creme! The love me tender bath and body oil in the Honey suckle grapefruit looks awesome. so do their whipped body cremes. I have the tea party button up! I loved 7clown circus, when her kids talked about needing to lose more teeth for extra money. I laugh every time I think about it. and mannequin always makes me smile! Those bath products look amazing - and so does the nighty! The whipped body creame sounds fabulous! Thanks! The whipped body cream sounds good, and so does the Sugar Kisses lip scrub. Makes me hungry to read the names of all the stuff on the site! I like the sweet dreams tank! Honeysuckle grapefruit whipped body cream! I need that. it's getting cold! I love pretty in paris, and everything on this site is so girly and pretty. Thanks for the contest. Okay, the whole Honeysuckle Grapefruit Bath collection sounds soooooooooooooo good! I love citrus. I love the knickers - black/ pink ruffle and the nighty as well!! I subscribe to your RSS, thanks. HI, the shimmer powder puff looks good, I'd choose the white with silver shimmer. great giveaway. Love the Wink Wink Tank and Knickers set. 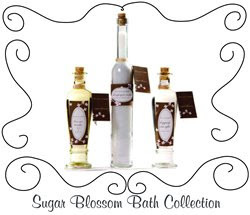 The sugar blossom bath collection sounds awesome! I love the nighty - plains and simple but would probably choose a pair of knickers to go with it. I would love to try their whipped body cream. That sounds so nice. Thank you so much! I like the Kiss me now lipgloss. Thanks! The roller ball eye shadow is awesome. I love this tea party!! My favorite would have to be Bella's Powder Room. Thanks for offering! My favorite find is the Rollerball eye shadow is Heartbreak Hotel and All Shook Up! I would love to get my hands on Bellas Powder Room Set. I just love make-up. I really like the Bella Frilly Set! I love the Whipped Body Creme. I love the Sweet Talk Sugar Set. I like the tank and knickers set! Super Cute!! I subscribed via the reader! I want the Sweet Talk Spice Set of lip glosses! I like the Bella Brush Set I am always looking for good makeup brushes and I love the pink color. You'll love that I'm a subscriber to your AMAZING BLOG, and I faved you on technorati....user name: leahita..
Just commented on Angie's Blog....http://angiescircus.blogspot.com/.....Wordful Wednesday-The Twins...Comment #52.
the nighty is super cute! The Cinnamon Honey Lip Plumper Trio sounds beautiful....and delicious! I like the SUGAR KISSES exfoliant. I really like this article and looks like a way cool product! also have the tea party button! The whipped body creme looks like something I must have! Angie's poem on this page was wonderful! The Roller Ball Eye Shadow is pretty cool. I love the Bella cosmetic Brushes.